This article is part of our ongoing series exploring the projects launched by the recipients of our Alumni Leadership Grant. As a Masters student at Harvard, From the Top alumna Karen Cueva had long been well aware of her passion for integrating the arts with social justice and education. During her studies, she co-founded the Du Bois Orchestra, a student group dedicated to bringing exposure to composers from backgrounds that are historically underrepresented in classical music. She wasn’t done there, however: After receiving the Alumni Leadership Grant, and with the Du Bois orchestra and fellow Harvard Graduate School of Education students by her side, Karen entered Boston’s Department of Youth Services to share the power of classical music with incarcerated kids whose futures, outside of the six 90 minute music sessions she offered, are uncertain. In many ways, one of the biggest challenges Karen faced was not opening these kids’ ears to classical music, but showing them that the all types of music are equally accessible for them to create and enjoy. She remembers the students coming into the project with, “a vast understanding (and strong opinions!) about music, spanning from local hip-hop artists to Beethoven symphonies.” These sessions, then, were intended less to educate the kids about classical music, and more to introduce them to ways to use music as a vehicle for expression in their own lives. These sessions were sometimes challenging to carry out because of the restrictions on bringing items like musical instruments in for the students. She and her fellow musicians were able to bring in only a couple of keyboards and her own violin. This allowed her to come up with innovative ways to create musical sounds, without needing to get too far into the details of music theory or technique. In addition to exploring instrumentation, activities included writing lyrics over hip-hop beats created by youth in another facility on the east coast. The kids were inspired by the work of people their ages in a similar circumstance, and Karen refers to their lyric-writing as, “a window into their aspirations as individuals beyond their current circumstance in the system, a quality mirrored in every artist’s desire to grow and evolve with time and life experience.” Sadly, the restrictions on recording equipment in the facility mean that she was unable to come away with tangible mementos of her time with these students—but all of the participants were able to come away with the shared wisdom and experiences that creating music can provide. Reflecting on her experience in her project, Karen, whose music has been intertwined with community service her entire life, found herself with a broader perspective not only of who quality arts education can serve, but also of herself. Presenting music in a space as nontraditional as a juvenile facility tested her strengths in adaptability. Using music as a tool for helping kids process and confront their lived experience is something we commit ourselves to at From the Top, and recontextualizing this goal led Karen to carefully consider issues of accessibility in the arts. Karen appeared on From the Top and received the Jack Kent Cooke Young Artist Award during Show 187 back in 2008. After receiving both a Bachelor’s and Master’s degree from Juilliard, she earned a Master’s in Arts Education from Harvard University. 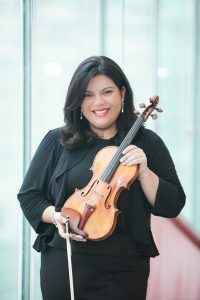 Karen currently serves as the Manager of Learning and Engagement Programs at Carnegie Hall’s Weill Music Institute.